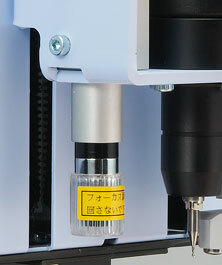 The Color micro-scope can be installed beside the head assembly of the PCB prototyping Machines. Easy plug & play with USB connection presents 30x / 60x display of the surface of the board. Please see "Pursuit of usability with camera" for the applicaion. 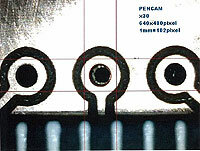 Please refer to "Comparison of models"
*The right side 40 mm of milling area is out of range of view field. 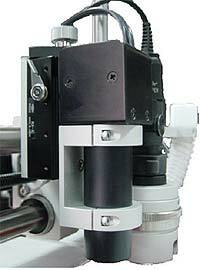 This is the useful option for the precision alignment and the measurement of the width of lines / spaces. *The right side 70 mm of milling area is out of range of view field.